Feast your eyes on the best arancini balls you will ever see and eat. With a touch of truffle oil, gooey mozzarella middle and the meaty depth of flavour from the porcini, make these the tastiest Italian balls around. In a large saucepan, bring the vegetable stock to a simmer over high heat. Reduce the heat to low and keep the stock hot. In a small bowl of hot water at the dried porcini mushrooms and leave to soak for 25 minutes. Sieve, reserving the stock and finely chop, add the porcini stock to the vegetable stock. In a large, deep, heavy saucepan, melt the butter over medium heat and drizzle a little extra virgin olive oil. Add the shallots and cook, stirring frequently for about 3 minutes. Add the rice and stir to coat with the butter. Add the wine and simmer until most of the liquid has evaporated, around 2 minutes. Add a ladle of the vegetable stock and stir until almost completely absorbed, about 2 minutes. Continue cooking the rice, adding the stock a ladle at a time, stirring constantly and allowing each addition of the stock to absorb before adding the next. Cook the rice until tender but still firm to the bite and the mixture is creamy, about 20 minutes. Add the truffle oil and mix well. Remove the pan from the heat, add the Parmigiano Reggiano, season with salt and pepper and add extra butter, mix well and leave to cool. Lay out 3 plates or shallow bowls. Put the beaten eggs in one, the flour (seasoned with a pinch of salt and pepper) in another, and the breadcrumbs in the final one. Once the risotto is cooled (it doesn’t matter if it is still a little warm, as long as it has stiffened up a bit and is cool enough to handle), roll into balls the size of golf balls, with damp hands. Push a piece of mozzarella into the middle of each ball, making sure that the cheese is completely enclosed. Leave to set in the fridge for at least 30 minutes or overnight. Dip a arancini ball into the flour, then dip into the egg, finish by coating completely in the breadcrumbs. Repeat with the remaining balls. Heat the oil in a large saucepan or deep fat fryer. In batches, fry the rice balls, turning occasionally, until golden, about 4 to 5 minutes. Drain on paper towels. Add the oil and garlic to a large skillet pan on a medium heat and cook until the garlic sizzles and goes golden. Then add the tomato passata, the tomato puree, the chopped basil and sage. Season with salt and pepper and stir. Simmer for around 45 minutes until the sauce reduces and thickens. 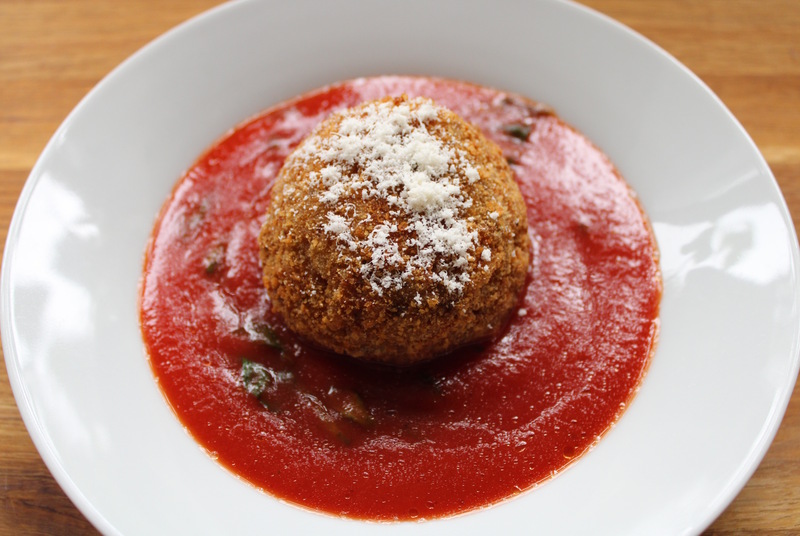 To serve, add the sauce to a serving bowl and then place the arancini on top and finish with extra Parmigiano Reggiano. Buon Appetito!